From March 6 to March 9, Sturgis East and West students took part in the National High School Model United Nations conference in New York City. The event gave Sturgis students the opportunity to debate and develop solutions to global issues that are impacting our world today. Participants in this conference acted as delegates representing the current member states of the United Nations. This year, Sturgis East represented Mexico. No matter what country each student spoke on behalf of, everyone had a common goal of finding peace and unity. Once the buses arrived at the New York Hilton Midtown, Sturgis students quickly introduced themselves to their fellow delegates. With fast-approaching deadlines to formulate resolutions that addressed the views of the 193 United Nations member states, delegates had to communicate and collaborate with each other in a timely manner. In the hours leading up to the final committee session, sponsors of different resolutions emphatically shared their views with others to ensure that their resolution would pass. Therefore, it was an incredibly rewarding feeling to hear delegates fill the room with applause after certain resolutions passed. On the final day of the session, students were able to enter the UN General Assembly Hall for an awards ceremony. The National High School Model United Nations conference is a perfect platform for students to embody what it means to be an IB student. Both the IB and NHSMUN seek to promote peace and global citizenship. By learning about issues that affect people from all walks of life, students recognize their responsibility to help the global community. Many thanks to Mr. Fetzer and Ms. Manrique for helping Sturgis East students attend this event. The trip would not have been possible without them. We look forward to seeing Sturgis East’s MUN club take part in NHSMUN again next year. Spring sports have finally begun, and thus the sailing season. The junior varsity team is coached by Coach Mendes, and the varsity team is led by Coach Demmin. Both teams practice at the Bass River Yacht Club. Best of luck to the sailing team as well as the baseball, track, tennis, lacrosse, and softball teams throughout the 2019 season! ​ The IB Expo recently took place for sophomore students who will be entering the IB program next year. The Expo included many resources to educate sophomores about what the International Baccalaureate entails and class options. Students were given a Sturgis “passport” and traveled from room to room where they could talk with IB teachers from each department. Current IB students were also present to offer advice about the Creativity Activity Service (CAS) portion of the program and Theory of Knowledge (TOK) class. Upperclassmen could provide information about their clubs that have helped them fulfill their CAS requirements in enjoyable ways, including the Stepping club, Prom Committee, Key Club, the Sturgis ROVers, Sturgis Singers, STAGE, Yearbook Club, Student Council, Health and Science Club, and more. Personally, as a current sophomore, I found this year’s IB Expo to be incredibly helpful. Not only did it allow us students to hear from teachers and ask them questions, but it also enabled us to gain insight from upperclassmen going through the IB. Overall, the IB Expo helps make the transition from the pre-IB classes of freshman and sophomore year to the IB courses of junior and senior year much smoother. Many thanks to the IB coordinators for organizing this event! On March 15th, Sturgis students gathered at 529 Main Street at the Sturgis Spring Dance, which was open to all grade levels. The dance was the first of a new annual Spring Dance to be planned by the Student Council. Taking advantage of the all-inclusive dance, the turnout was mostly freshmen students. Students were able to request what songs were played which added to the excitement in the air. Thank you to Student Council Sophomore Representative Mariana Furner for sharing this information, and good luck to StuCo in continuing the spring dance in future years! On March 16, the Scholastic Art and Writing Awards held a ceremony commemorating this year’s regional winners. The ceremony was held at Tufts University. Students’ work was displayed at the Breed Memorial Hall on Tuft’s campus from March 16 to March 25. The award winners were also listed in an edition of The Boston Globe. The following is a list of the winners from Sturgis East and West and their awards. Each spring, the Cape Cod Times holds an annual contest for Cape and Island students in grades 4-12. The 2019 Classroom Times, a special newspaper section of the Cape Cod Times, was recently published on March 30th. Participants could enter their work in the writing category (including news/features, opinion, reviews, and sports) or photography section (including classroom assignments and snapshots). The first place award in the reviews category for students in grades 9-12 went to Caroline Curran, a sophomore at Sturgis East. Her piece was titled, “Film captures women’s fight for voting rights.” It is a review of the film “Iron Jawed Angels” which depicts the women’s suffrage movement of the 19th and 20th century and the organizations that led the fight for voting equality in the United States. Caroline Curran first saw this film in her U.S. History II class, which is taught by Ms. Emily Lambdin. This year, thirty-eight schools participated in the Classroom Times competition. Congratulations to Caroline Curran and to all of the talented student writers and photographers from Cape and Island schools who submitted a piece this year. If you would like to view the 2019 Classroom Times, visit capecodtimes.com/classroomtimes. 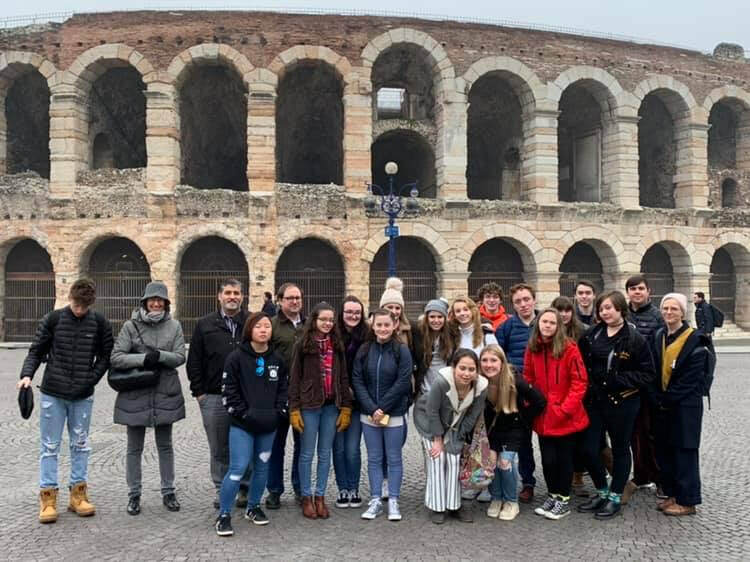 From the 14th to the 22nd of February, Sturgis students went on a trip to the beautiful city of Trento in northern Italy. They were able to explore a different lifestyle and culture by staying with host families for the week. Students visited the Buonconsiglio Castle in Trento and later traveled to the cities of Verona and Venice. In addition, they shadowed at the school of the students they were staying with. Lyle Edwards, a sophomore at Sturgis East, says, “I remember playing telephone with a few of our classmates and Italian students. It was hilarious because of the slight language barrier, and it was a lot of fun.” The trip allowed students to immerse themselves in Italian culture after the Italian students visited Cape Cod earlier this year. Tell me about your day-to-day experiences. How was your experience as a student shadowing at an Italian school? Many thanks to Mr. Bihl, Mr. Churchill, and Madame O’Keefe for coordinating this exchange. The first student-written, one-act production at Sturgis East was performed on February 8, 9, and 10 at 529 Main Street. The play is titled “Say Yes!” and follows Marty (Noah Whelpley), a millennial with such a negative attitude that his girlfriend Miriam (Sita McGuire) breaks up with him. In an effort to be more positive, Marty vows to say only “Yes” to every question or opportunity that comes his way for twenty-four hours. This causes him to get involved in a bank robbery spearheaded by the mysterious Tim the Rat (Kelly Gototweski), and a chance encounter with the homeless Pete Reese (Maeve King) may prove to be the key to escaping the situation. At the same time, Marty’s friends Jo (Paige Joy) and Harriet (Grace Ripley) are dealing with problems of their own, and his parents (Patrick Preston and Lucy Knox) are rethinking certain decisions they have made. The play was written by Carmela Davies, Macklin Devine, Kelly Gototweski, Olivia Wilson, and Rowan Wood. It was directed by Ms. Young and assistant directed by Wilson and Wood. Sturgis East presented its play alongside Sturgis West’s production of Alan Haehnel’s “A Simple Task.” Both schools brought their plays to the Massachusetts Educational Theater Guild, which was hosted at Bourne High School on March 2. It was an all-day event that included eight one-acts performed by different high schools from all over Cape Cod. ​ On February 5, the Sturgis East ROVers club invited Jessica Donohue from Sea Education Association to speak about her research on microplastics in the ocean. Through her talk, Donohue hoped to raise awareness about the impact that plastics have on our ecosystem and discuss approaches we can take to help solve this problem. Microplastics are small pieces of plastic that have been broken up in the ocean. After plastic products enter the ocean, they break down and become smaller, though they eventually reach a point where they cannot change shape anymore (becoming smaller than 5 mm in size). Organisms such as plankton can then be harmed by consuming these microplastics. Subsequently, other aquatic animals in the food web can get sick or die by eating the plankton. Therefore, these seemingly-small plastics can have a widespread impact. It is important that we reduce the number of plastics that enter the ocean to protect all forms of sealife. Jessica Donohue added that a common misconception about microplastics is that they are most abundantly found near the coast, close to civilization. However, due to large-scale ocean currents, plastics actually congregate in zones called gyres in the North Atlantic and North Pacific. In addition, some plastics do not float near the surface of the ocean and are difficult for scientists to detect, so while the problem of plastics in the ocean appears to be a major issue today, the situation could be even worse than scientists realize. On the local scale, businesses have begun to shift away from depending on plastic products. Citizens can help reduce ocean pollution by recycling, avoiding using single-use plastics, and spreading the word about this issue. With a greater sense of awareness and urgency to stop the flow of plastics into the ocean, our society can protect our own future and the future of a myriad of aquatic organisms. Many thanks to Jessica Donohue for visiting Sturgis East to discuss her work. If you have any further questions, you can contact Jessica Donohue at jdonohue@sea.edu. ​ On January 31st, Sturgis East students participated in the school’s Poetry Out Loud (POL) competition. POL is an event in which students from across the U.S. recite poems from memory in front of a panel of judges. Throughout these competitions, students are taught important skills. They develop skills in public speaking by presenting in front of an audience of their peers. In addition, they gain experience in understanding sophisticated poetry and memorization through useful techniques. Students also become familiar with different authors and voices in literature that they may not have previously known. Students have the ability to choose the poems they recite from an official database of hundreds of poems, giving them a lot of freedom to find a poem that they truly enjoy and can connect with. POL leaves room for students to interpret different meanings of each poem. Each year, one student from each English class in the 9th and 10th grade is nominated by his/her peers to participate in the schoolwide competition. Each student memorizes two poems for the event. Students are judged on physical presence, voice and articulation, dramatic appropriateness, evidence of understanding, and accuracy. This year’s winner was Caroline Curran, followed by the runner-up, Andrew Juan (both sophomores). Caroline Curran will be representing Sturgis East at the regional POL competition on Sunday, March 10, at the Cultural Center of Cape Cod in Yarmouth. The StormWatch would like to wish Caroline Curran the best of luck in the next competition. Also, many thanks to the Sturgis librarians, Ms. Milne and Ms. Prantis, and the English department for putting together this event. There is a new club at Sturgis East called the Film Club that meets every Wednesday during lunch in room 207. It is a club centered around creating a full-length film. I asked Rowan Wood, the student leader of the club, a few questions to learn more about the club’s plans for 2019. What inspired you to start Film Club? “I have been interested in film for as long as I can remember. It has always been a part of my life, partly because my dad is a film fanatic. Between us, we own countless DVDs, and we love to spend time together watching as many movies as we can. I began to make short films at a very young age (mainly with the assistance of my dad), but in the past five years I have been branching out and making films of my own,. I have even managed to make a few seasons of a short-form television series. A little while ago I realized that, as a sort of pièce de résistance, and to truly make my mark as a young filmmaker, I would need to complete a feature-length film. Now I am ready to fully commit to this project. What do you plan on doing in Film Club? What do you hope to accomplish in Film Club? What would you like any new members to know about the club? The Sturgis StormWatch would like to wish the Film club the best of luck in their future endeavors. In January, Sturgis students took their midterm exams. For many students, exam time can be full of stress. With an entire semester worth of material to review, it’s easy for students to feel pressure. Fortunately, Sturgis makes many efforts to help students minimize this stress. In the days leading up to exam week, the school provides students review days. “I felt well prepared from the review days for most of my classes, and my teachers were very supportive and helpful in the week leading up to the big tests,” said sophomore Mia Sylvia. It is important for students to use the time after midterms to reflect on their exams. Looking back and reviewing your midterms can help you by revealing gaps in your knowledge as well as where your study habits may have fallen short. Sturgis is a strong community filled with support and resources including peers, teachers, and counselors. Giving consideration to your exam results and using Sturgis’ resources can help everyone be the best student they can. Monday, October 22 marked the first day of Spirit Week this year, Pajama Day, a day where students can stay comfortable throughout the whole day! Many students and teachers took part in Pajama Day, and it was a great way to start out this wonderful week of school spirit. Many students came in themed onesies, such as sophomore Grace Rizzuto who dressed as a dragon. On Pajama Day students could dress in their coziest outfits, which always makes it a school favorite. All of the grades had high participation to start off the week! Twin Day has always been a tradition at schools across the country, and in the past Sturgis has combined that tradition with another, more original tradition; last year it was Tacky Tourist Day, and on last Tuesday, October 23, Sturgis East had their first Meme Day! Ever since the Internet, and even before, memes have been icons of pop culture; and especially now, memes are created as quickly as they are forgotten. There are those, however, that aren’t so easily forgotten; Sturgis students were seen dressing as those memes, and it was joyous fun recognizing everyone’s choice of memes and how they chose to represent that meme! There were those who went the route of choosing to dress as twins; and whether they were dressed twins or memes, they still earned points for the grade. The seniors emerged on top for Tuesday with 400 points, followed by the juniors with 300 points; next were the sophomores with 200 points, and finally, the freshmen with 100 points. If Spirit Week had started seven days later, this year’s Halloween Day would have fallen on October 31; however, because of scheduling and such, Halloween Day took place on Wednesday, October 24. This year, students and teachers dressed up in a ton of creative costumes. Halloween is a perfect opportunity to put care and effort into a costume, and to have it pay off when you go out on Halloween night to collect your well-deserved stash of candy! Or, if you’re not a trick-or-treater, you can show your love and spirit for the holiday by dressing up during Spirit Week! The juniors scored the most points on Halloween Day with 400, followed closely by the seniors with 300; the freshmen placed third with 200 points, and, last but not least, the sophomores collected 100 points. Each year both of the Sturgis campuses unite at the Homecoming dance. This year’s dance was held on November 2nd at the Cape Codder Resort. Professional photographer Jarvis Chen takes high quality photos at the dance each year. The photos can be found at: https://jarvischen.zenfolio.com/f802673462. A collective sigh could be heard from both sides of the field as a shot on net went wide. In typical East-West tradition, the support of the fans for both teams was out in full force. Bullhorns, signs, and noisemakers were held by East fans as they anxiously awaited the turning point of the game. After a back and forth effort by both teams, a scramble for the ball broke out in front of the West goal as the clock winded down and was kicked in by an East player. Screams of “East is Beast” deafened spectators around the field. Even West’s most valiant efforts couldn’t penetrate the East Boy’s defense, anchored by Captain Aidan Smith. As the end of the game drew near, the Storm offense took on a life of its own. Senior Brendan Boy scored two goals to put the Storm up 3-0. East fans screamed and chanted as their star players ran off the field, eager to celebrate the victory over their archrival. The boys team received strong contributions from seniors Will Furtado, Franz Abagat, and Charles Peterkin as well as junior Noah Whelpley. Freshman Alex Stec had a huge impact on the momentum of the game and kept the Navigators off balance. The conclusion of the boys game was only the halfway point of the exciting Homecoming action. The East and West girls teams showed support for breast cancer awareness as their “Pink Game” rolled on. Sturgis East seniors Hanna Blake, Emily Boyle, and Emily Simonian were honored before the game. A sign of Captain Emily Boyle was created by a fellow senior and used to generate cheers from the Storm sidelines. This time, though, the West girls prevailed, winning 3-0 in a tough game. The East girls had key contributions from their three seniors, junior Maggie Sandland, and many others. All in all, it was a great night for both East and West. The games renewed the rivalry between both schools, and it was a great way to kick off the festivities for Spirit Week. On Monday, October 30, Sturgis East juniors Whitney Meritus and Jerry Curran and Sturgis West senior Julia Berestecky attended Philanthropy Day at the Resort and Conference Center at Hyannis. Philanthropy is the concept of giving back to one’s community through charity work or donations. The trip gave students from across the Cape the opportunity to brainstorm ideas with each other on how to be involved in their community and to share what they have accomplished so far. Students also heard from award recipients for their acts of philanthropy. It was a very inspiring event. ​ Sturgis East and West students attended the school’s annual college fair. This year, the fair moved to 529 Main Street, allowing for more colleges and students to take part in the event. Over 60 colleges were present. Students from all grade levels were in attendance. ​ On October 10, juniors at Sturgis East took the Preliminary SAT/National Merit Scholarship Qualifying Test (PSAT/NMSQT). The event gave students insight into the format of the SAT and exposed them to the conditions of the test. The PSAT is 2 hours and 45 minutes long and includes sections in reading, writing and language, and math. It covers many of the same topics and is nearly the same length as the official SAT (which is 3 hours plus an optional 50-minute essay). Therefore, the test helped answer many of the students’ questions about what to expect on the SAT. The test allowed students to identify areas for improvement as they continue to study. In addition, the test gave students invaluable test-taking experience. They began to develop skills such as endurance that only come with practice. The results of the PSAT will be released on December 11. Mr. Brannelly is a new addition to the Latin department and is currently the substitute for Ms. Singh. I interviewed him recently to learn about his background and his experience at Sturgis so far. 1) Could you share a little bit about your background and how you ended up at Sturgis? I am from Dover, MA and have been spending my summers down the Cape from an early age. After earning my BA in Classics from Cornell University I taught for 2 years at Barnstable High School. I then enrolled as a Grad student in Classica at the University of Virginia where I earned my MA in Classics. I am currently ABD ("all but dissertation" status) for my PhD. I decided to take the Sturgis job so that I could continue teaching Latin while I finish my dissertation. 2) How has your experience been at Sturgis so far? What has been the best part of being involved in the IB program? I have very much enjoyed my experience at Sturgis thus far. The students are very courteous, respectful, and engaging. As for the IB program, although I'm not currently teaching any IB classes, the most rewarding part is still taking students from understanding grammar and vocab to thinking more deeply about a given text. 3) What has been your favorite part of teaching at Sturgis? The long lunches. Haha, just kidding. I would have to say the camaraderie and sense of community that the school cultivates. Along the same lines, I also appreciate that Sturgis endorses individual expressionism and encourages students to be themselves in a safe and nurturing environment. 4) Have you always known you wanted to become a teacher? What inspired you to become one? When did you first know that you wanted to teach Latin? I have had a love for Latin and Ancient History from my middle school years, particularly in the wake of a trip I took to Italy and Greece with my high school as a freshman. I certainly credit my early Latin teachers as well as my university professors, but also the breadth of the subject, which includes the learning of the language, but also the history, religion, politics, and every facet of ancient Roman/Greek culture. There is always something new and interesting to learn about the Romans/Greeks and it is usually something that requires further thought and analysis. 5) What are some of your hobbies outside of school? I am an avid golfer and tennis player. I love to travel to just about anywhere. I am a big cinephile, not just for entertainment purposes; I appreciate film as an art-form and as a modern medium for the expression of ideas, emotions, and possibilities. I also enjoy saltwater fishing in the summer. The Sturgis StormWatch would like to thank Mr. Brannelly for his thoughtful responses and wish him the best as he continues to teach at Sturgis East.